My story starts in 1914, when my grandfather, Rabbi Gershon Katzman, came from White Russia to the US for medical treatment. But then World War I broke out, and he was stranded here. He became the rabbi of a small Orthodox community in San Francisco, while waiting to return home. But that was not to be. The Russian Revolution followed World War I, and it took him almost ten years to get his family out, including his daughter (my mother), my father (Rabbi Yaakov Karasick) and their children (my sisters and I). Incidentally, my father came from the city of Barbruysk, which was the home to a large Chabad community – in fact, the name Karasick is a common name of the Lubavitchers from that area. Throughout his life, my own father kept some of his old Chabad customs, even though he was cut off from his fellow chasidim while living in San Francisco. I grew up there as a young boy but, after my Bar Mitzvah, I was sent away for religious studies which did not exist nearby. Eventually, I enrolled in Yeshivas Rabbeinu Yitzchok Elchonon (which is now called RIETS and is a part of Yeshiva University). There I became a student of Rabbi Yosef Ber Soloveitchik, better known as the Rav, and received rabbinic ordination from him in 1945, at the tender age of twenty-three. A year later, on the day of my wedding, my grandfather decided that I should get a blessing from somebody very special and holy. Although he himself was not the least bit chasidic, my grandfather selected the Previous Lubavitcher Rebbe as that person. It was strange that my grandfather would make this choice, but it must have been Divine Providence. The Rebbe was very ill at that time, having suffered terribly in Soviet prison before coming to the US. He was wheelchair-bound and could barely speak. He was in terrible pain, and he passed away three years later. However, he agreed to give us his blessing. I recall how he looked – he was a beautiful man, with very piercing eyes. I received many, many blessings over my lifetime from great sages and mystics, but I think that particular blessing from the Previous Rebbe had the greatest effect on my whole life, which proved a very exciting and diverse life. And I attribute so much of it to this blessing. After getting married, I served as the rabbi of Congregation Shearith Israel, the Spanish and Portuguese synagogue of Montreal, Canada, but after a couple of years, I was forced to return to New York in order to help my father-in-law in his watch business. I was very unhappy to leave the rabbinate, and so, while in New York, I volunteered with the Orthodox Union, first organizing a fund-raising dinner, eventually becoming an officer and, finally, in 1966, president of the organization. During this time, I continued my relationship with the Rav, driving him to events and the like, and we became very close. Once he told me that as a young boy he had a tutor who taught him the Tanya, the seminal work of the Alter Rebbe, founder of the Chabad Movement and, from that point on, he developed a great admiration for Lubavitch. Of course, it is well known that while studying at the university in Berlin, he befriended Rabbi Menachem Mendel Schneerson, who eventually became the Lubavitcher Rebbe. I, myself, despite my father’s Chabad roots, did not identify with Lubavitch at all, although I did attend a couple of farbrengens at the Chabad Headquarters. So, it was a great surprise to me when I got a call that the Rebbe wanted to see me. This was about a year after I became the president of the OU. I went, of course, and the Rebbe greeted me warmly. The first thing he told me was: “Karasick – that’s a Lubavitcher name.” And that led me to tell him the whole story of my family, and then the story of my relationship to the Rav. All that took a while and during that time the reason he called me in did not come up. I told him that I was trying to expand the organization, so that its resources could be used to help communities throughout the world, and that I was organizing a large conference toward that end. Unfortunately, while this conference was being organized, a controversy arose due to some misinformation about it. This is why the Rebbe wanted to see me. But I explained to him why what he had been told was incorrect. The Rebbe accepted my explanation. However, following our meeting, I made sure there would be no further misunderstandings. The conference was held as planned in Jerusalem, and it proved hugely successful with forty countries represented and three thousand people in attendance. I have followed the Rebbe’s advice to this day, and I tell others about it. Everyone is very taken with this advice. It truly changes the way a person prays since reciting the same prayers three times a day can become a rote exercise. His advice was absolutely brilliant. 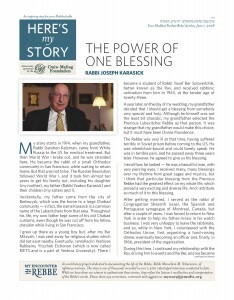 Rabbi Joseph Karasick, who served as president of the Orthodox Union from 1966 to 1972 and chairman of its board of directors from 1972 to 1978, is the author of the memoir, Thirteen Steps. He was interviewed in January of 2016. A Great G-d in a Tiny Room Who is a Chassid?